The IELTS Speaking test often has at least one question that asks you to make some guesses about how the future will be different to today. These questions are usually in Part 3 but sometimes Part 1 or Part 2 have questions about the future. Many IELTS candidates are not very strong at making a variety of sentences to talk about the future. These notes list some of the main ways to make these sentences. In the IELTS Speaking test, you might be able to impress the examiner enough to move from a Band 5 score to a Band 6, just by making a few good sentences about the future! In other words, if you are asked a question about the future and you are NOT prepared, you are unlucky because this kind of question is one of the most difficult questions in the Speaking test. But if you are asked this kind of question and you ARE prepared, you are lucky because you have a good opportunity to impress the examiner. One kind of sentence which you really should practice is the sentence using ‘there + be’ in the future tense. (Model 2 in these notes.) This is because ‘there + be’ is widely used in English to make sentences but many people are not very skilled using ‘there + be’ in the future tense and in the spoken form. Notice two things: 1) The contracted form of ‘there will be’ is the most natural way to speak this sentence; 2) The sentence is made more accurate by adding an adverb such as ‘certainly’ between the words ‘will’ and ‘be’. When talking about the future, we most often use the word “will” but that is not the only way to talk about the future. 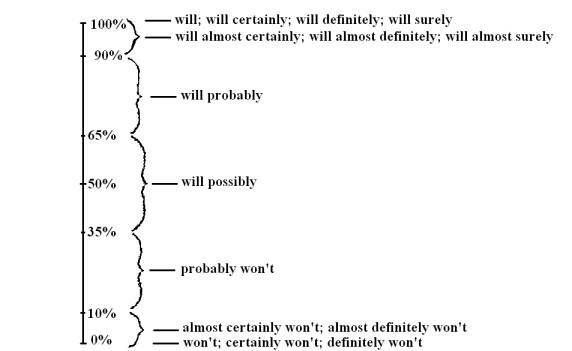 The following diagram shows how adverbs can express different degrees of certainty about the future. b) These adverbs can be used either before or after the word, ‘will’. In other words, we can say, ‘probably will or ‘will probably’. However, when we use the word, ‘won't’ (or ‘will not’), we can only put the adverb before the word ‘won't’. c) These percentages are approximate values. Some people might mean that ‘possibly’ is anything between 0.01% and about 65%; a mathematician might mean that ‘probably’ is ‘more than 50%’. d) You can think of ‘probably’ as meaning ‘很可能’ . The following are some different ‘models’ for talking about the future. Models 1 to 13 involve different ways to use the verb ‘will’. Models 14 to 17 use the Modal Verbs ‘might’, ‘may’, ‘could’, ‘should’ and ‘ought to’ instead of ‘will’. Model 18 uses, ‘be certain to/be sure to/be bound to/be likely to/be unlikely to’. Model 19 uses, ‘There is certain/sure/bound/likely/unlikely to be + noun’. Model 20 shows some (usually more formal) ways of talking about the future using the nouns, ‘likelihood’, ‘certainty’, ‘probability’ and ‘possibility’. Model 21 shows three idiomatic expressions used for talking about the future. Model 22 shows how, ‘going to’ can sometimes mean the same as ‘will’. Model 23 shows the grammar of ‘hope’ and compares ‘hope’ to ‘wish’. Basically, you should use ‘hope’ when talking about the future and use ‘wish’ when talking about how you would like to change the present or the past (both impossible). Model 24 shows that ‘can’ should not be used when talking about the future (except when using ‘hope’) – ‘will be able to’ should be used instead. Model 25 shows that ‘must’ should not be used when talking about the future – ‘will have to’ should be used instead. Model 26 explains the use of ‘shall’. Model 27 explains the use of ‘ago’ and ‘in’ when referring to countable time units from now ( relative to now) in the past and the future. 1.1 Yes, it’ll rain tomorrow. = Yes, it’ll definitely/certainly rain tomorrow. 1.2 Yes, it’ll almost certainly rain tomorrow. 1.3 Yes, I think it’ll probably rain tomorrow. 1.5 No, it probably won’t rain tomorrow. 1.6 No, it almost certainly won’t rain tomorrow. 1.7 No, it definitely won’t rain tomorrow. Note that, in place of the word ‘will’ we can substitute the modal verbs, ‘might’, ‘may’, ‘could’, ‘should’, and ‘ought to’. (We can also substitute the modal, ‘would’ but this is not used when talking about the future.) However, when we use ‘might’ or ‘may’ we cannot use the adverbs, ‘probably’ or ‘possibly’ because ‘might’ and ‘may’ already include the idea of ‘possibly’. On the other hand, we can use ‘certainly’, ‘definitely’ and ‘surely’ with the modals ‘might’ and ‘may’ as a way to emphasize what we are saying. See also Models 14-17, below. Sometimes the verb, ‘experience’ is suitable instead of, ‘have’ or ‘see’. For example, “I think we’ll experience some very hot weather over the next few years.” However, to ‘experience rain’ is not a very suitable verb-noun combination. Here, the suitable adjectives are: certain, definite, sure, probable, likely, possible, improbable, unlikely, impossible, and doubtful. NOTE: Model 5 examples are not often used because there are simpler ways to express the same idea. Model 18 is similar to but simpler than this model. Note that “Maybe it'll rain tomorrow.” means the same as, “It may rain tomorrow.” (See Model 14.) However, in the second example, ‘may ’ is a verb which is followed by another verb (including the verb, ‘be’) while ‘maybe’ is an adverb. 8.1 I doubt it’ll rain tomorrow. (=1.5 probably won’t) = I don't think it'll rain tomorrow. 9.1 Twenty years from now, China’s economy will be much more developed. 9.2 Hopefully, China’s present-day environmental problems will be solved in the not-too-distant future. 10.1 In twenty years, people will probably be living on the moon. 10.2 I’m sure that, within a few years, people in China will be enjoying a high standard of living. 10.3 People will probably be driving electric cars (at some point) in the future. 10.4 I predict that, in the future (= at some point in the future), many people will be working from home, using the internet to communicate with their workplace. 11.1 By 2020, China’s standard of living will have reached a high level. 11.2 I’m sure some Chinese people will have landed on the moon before 2020. 11.3 I’m confident that, twenty years from now, medical science will have already found a cure for cancer. 11.4 I believe that, within the next twenty years (= some point within the next twenty years), China will have become the world’s leading country. 12.1 I’m sure that many of today’s social and environmental problems will have been solved by the year 2020. 12.2 I predict that cures for AIDS and cancer will have been discovered by the year 2020. 12.3 I’m sure that certain educational reforms will have come into effect by the year 2020. 12.4 China’s education system will probably have been reformed somewhat by the year 2020. 13.1 I think that, by 2020, people will have already been driving electric cars for a few years. Models 14 –17, using the modal verbs. 14.1 It might rain tomorrow. ‘Might’ and ‘may’ have the same meaning. The difference between the two is that relatively uneducated English speakers never or rarely use ‘may’ while well-educated English speakers use both - sometimes using ‘may’, especially in situations where they want to sound more polite, and sometimes using ‘might’. You should not ONLY use ‘may’ because this will make your speech seem unnatural and pretentious. NOTE: Model 17 is not often used for the future. Note that when speaking about simple topics such as rain, most English speakers would choose simpler ways to speak than these examples. However, when discussing more serious topics, these sentences are suitable. Using the nouns, ‘likelihood’, ‘certainty’, ‘probability’, and ‘possibility’. These examples are quite formal language which is frequently used by ‘experts’ in a particular field, for example, by weather forecasters on TV. Model 21: Idiomatic expressions about the future. Certain idioms are frequently used to express ideas about the future. Idiomatic expressions are most suitable for informal, spoken English. 22.1 I’m going to see my girlfriend this weekend. 22.2 It’s going to rain soon. 22.3 Look at that car! It’s going to crash! 22.4 She’s going to have a baby in January. = She’ll have a baby in January. 22.5 It’s going to be a hot day tomorrow. = It will be hot tomorrow. 22.6 Unfortunately, I think there’s going to be a few more wars in the near future. = Unfortunately, I think there’ll be a few more wars in the near future. Model 23: hope + present tense (= expressing a wish/hope for the future). 1) ‘Hope’ (希望) is used to express a desire for a real possibility in the future. The grammar is, hope + present tense verb. NOTE: Although it is possible to use ‘will’ after the word, ‘hope’, it is best NOT to say or write ‘hope + will’ because this sounds incorrect to many English speakers. Therefore, the best idea is to use the present tense after ‘hope’ most of the time. However, in the (假设的) situation [see 5) below], ‘hope + will’ sometimes sounds more natural than ‘hope + present tense’. I hope you have a good time tomorrow. I hope I get a good score in this test. = I hope to get a good score in this test. She hopes she gets the job. = She hopes to get the job. I hope I see her at the party. = I hope to see her at the party. 2) ‘Wish’ can be used with the same meaning as hope, above. However, this meaning for ‘wish’ is 祝, not 希望 and it is followed by a noun, not a verb. I wish you a good time tomorrow. I wish you success in this test. (I don’t have much money.) I wish (that) I had more money. (I grew up in a small village.) I wish (that) I had grown up in a big city. Note the grammar (which seems a little strange): “I wish I had more money” uses the past tense but the meaning is not past tense – it simply expresses a desire to have a different present situation. Similarly, “I wish I had grown up in a big city” uses the 过去完成时 but the meaning is that the speaker would like to change the 过去时, not the 过去完成时. In many cultures, people throw a coin into a ‘wishing well’ and make a wish. Or, they might make a secret wish when they cut their birthday cake. ‘Making a wish for + noun’ is really the same as ‘hoping for + noun’ or saying, ‘I hope + present tense verb’. Similarly, we can say (or write), “My best wishes to you.” This really means, “I hope your future is good.” “I wish you a merry Christmas” is another example of this. Note that you should only use the expression, ‘wish for + noun’ in the rather rare situations of making a wish when you throw a coin into a wishing well or cut a birthday cake or similar rituals that are used for making wishes. This is used to express regret, dissatisfaction, impatience or irritation. Everybody wishes you’d (you would) go home. = Everybody hopes you’ll go home. = Everybody hopes you go home. = I hope you’ll stop smoking. = I hope you stop smoking. = I hope you don’t drive so fast in the future. = I hope you won’t drive so fast in the future. Or = You are driving too fast now and I would like you to drive slower. This use of ‘wish’ is formal and sounds a little old-fashioned. In everyday spoken English, it is best to AVOID using this and, instead, use ‘would like’. Formal or ‘ultra polite’ language does have a place in English, for example, when a waiter in a high-class restaurant speaks to a customer or when the speaker especially wants to show deference to a very important or high-ranking person. However, in the IELTS test and in most everyday speaking situations, it is not suitable. I wish to see the manager. = I’d like to see the manager. Where do you wish to sit? = Where would you like to sit? I wish to study in the U.K. = I'd like to study in the U.K. = I want to study in the U.K. IMPORTANT NOTE! DO NOT USE ‘CAN’ WHEN TALKING ABOUT THE FUTURE. INSTEAD, USE ‘WILL BE ABLE TO’. 24.1 After (=when) I go to Australia next year, I’ll be able to practice speaking English every day. IMPORTANT NOTE! DO NOT USE ‘MUST’ WHEN TALKING ABOUT THE FUTURE. INSTEAD, USE ‘WILL HAVE TO’. 25.1 After I move to Shanghai, I’ll have to find an apartment. Some people try to use ‘must’ for the future when their meaning is, 一定是. In this case, they should not use ‘must’ but should use, ‘certainly will’ (or, ‘definitely will’, ‘surely will’ or simply, ‘will’). In Britain, ‘I shall’ and ‘We shall’ mean the same as ‘I will’ and ‘We will’. However, in the other English-speaking countries, ‘shall’ is only used in quite formal situations (such as in an important speech) or when someone wants to sound extra polite. Even this ‘extra polite’ usage is not very common among non-British English speakers. The diagram below shows a ‘time line’. A time line represents countable units of time such as minutes, days, years, etc. Many people make grammatical mistakes when talking about situations on time lines. When talking about a point in time that is specified as X units of time FROM NOW, use ‘IN’ (for the future) and ‘AGO’ (for the past). You can use the words ‘later’, ‘after’, ‘before’, ‘previously’ and ‘earlier’ relative to any other time, both future and past, but NOT relative to now. This usage of ‘in’ is completely different to the meaning, 里边. In some parts of the U.S.A., for example, Texas, it is acceptable to use ‘later’ or ‘after’ relative to now. However, in British English and among most educated Americans, that is considered to be a grammatical mistake. 1. I’ll go to Shanghai in four days and I’ll return three days later. 2. I’ll go to Shanghai in four days and three days after that, I’ll return home. 3. I’ll return from Shanghai in seven days. 5. I went to Nanjing eight days ago and I came back five days later. 6. I went to Nanjing eight days ago and, after spending five days there, I came back home. 7. I came back from Nanjing three days ago.